…and by 23:16 #paintingstalk was a thing. – Sunday night a volunteer chooses a painting for discussion on the following Tuesday at 20:00 GMT. – They post it on Twitter using the #paintingstalk hashtag. – They post a blog within 24 hours saying why they chose the painting and including some links for research. – Tuesday at 20:00 we discuss the painting. – People might continue to chat about it for the rest of the week. – The following Sunday it’s Storified by someone who knows what they are doing (it’s pretty easy apparently). Except, I thought, after talking to @MissSMerrill it might be good, because we’re teachers, to include in the blog a short description of how we might use the painting as a lesson resource. This is a painting that has always intrigued me. It’s full of questions – Who is the man in the doorway? Who are the people in the mirror? How can the artist be in the picture? 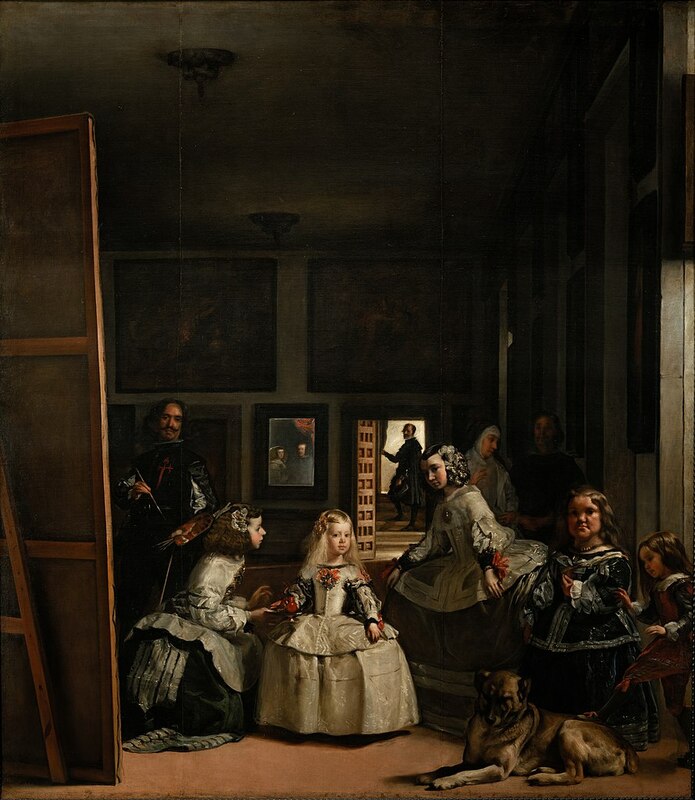 When I saw it hanging in the Prado in Madrid I realised it is more or less life-size and the idea is to feel like you are in the room with these people. It’s a mesmerising experience. The girl in the centre of the frame is looking right at you, a tiny smile on her face, the carpet seems to extend out and into the room you are standing in. The elements of dramatic imagination are movement and stillness, darkness and light, sound and silence. They are all in this painting. It is a moment in time, now long gone, all the people are dead, yet it feels like it is still happening. You can see the light from the window cast on the girl’s face, you can hear her sister beside her whispering, you can see the little boy’s foot at it is about to kick the dog and start it barking. A second from now this moment will be gone. I tell them not to guess what’s happening, but just to say what they can see. This is useful, I tell them, for when they’re writing. Artists and authors don’t tell, they show. They want their audience to decide what their works means. They want it to speak for itself. Works of art – paintings, books, films, etc – are made for a purpose, nothing in them is there by accident. Paintings are full of clues telling us what they mean. But you need the eyes to see them. Artists uses signs to represent what they are trying to say. Words are signs, so are icons and symbols. The red cross on the chest of the man holding the paintbrush means something to the people in the painting, even if we don’t understand it now.